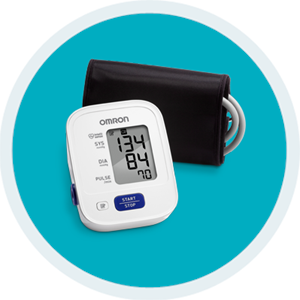 Omron 3 Series home blood pressure monitor with Omrons Advanced Accuracy is quick and easy, helps ensure consistent, precise readings and utilizes a simple one touch mode, which can store up to 14 readings at a time while still giving you an accurate reading every time you monitor. The Omron 3 Series blood pressure monitor includes a wide range D-Ring cuff that fits both standard and large arms from 9 to 17 inches. The 3 Series also includes an irregular heartbeat detector which, while measuring your blood pressure, will also identify and alert you to any irregularities in your heart beat that will allow you to consult with a medical professional.